﻿ Matthew 17:5 While he yet spake, behold, a bright cloud overshadowed them: and behold a voice out of the cloud, which said, This is my beloved Son, in whom I am well pleased; hear ye him. While he was still speaking, behold, a bright cloud overshadowed them. And lo, a voice out of the cloud, saying, This is my beloved Son in whom I am well pleased. Hear ye him. While he was still talking, suddenly a bright cloud engulfed them. Just then, a voice spoke out of the cloud, saying, "This is my dearly loved Son, who is very pleasing to me; listen to Him." While he was yet speaking, behold, a bright cloud overshadowed them; and lo, a voice from the cloud, saying: This is my beloved Son, in whom I delight; hear him. While he was still talking, a bright cloud came over them: and a voice out of the cloud, saying, This is my dearly loved Son, with whom I am well pleased; give ear to him. While he was still speaking, behold, a bright cloud overshadowed them; and a voice from the cloud said, "This is my beloved Son, with whom I am well pleased. Listen to him!" while he was speaking, a bright cloud surrounded them: and suddenly a voice broke out of the cloud, saying, "this is my beloved son, in whom I am well pleased; hear ye him." He still speaking, behold, a white cloud overshadowed them: and behold a voice out of the cloud, saying, This is my beloved Son, in whom I am delighted; hear ye Him. As he spoke a bright cloud overshadowed them and a voice from the cloud said, "This is my Son, my Beloved. He is my Chosen. Listen to him!" While he yet spake, behold a bright cloud overshadowed them, and behold a voice out of the cloud which said, This is my beloved Son, in whom I delight: hear ye him. He yet speaking, behold, a shining cloud overshadowed them: and behold a voice out of the cloud, saying, This is my dearly beloved Son, in whom I was contented; hear ye him. [While] he was still speaking, behold, a bright cloud overshadowed them, and behold, a voice from the cloud said, "This is my beloved Son, with whom I am well pleased. Listen to him!" While he yet spoke, behold, a bright cloud overshadowed them. 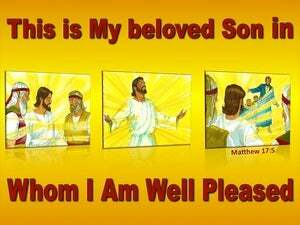 And behold a voice out of the cloud which said, This is My beloved Son in whom I am well pleased, hear Him. While he yet spake, behold, a bright cloud shadowed them. And behold, there came a voice out of the cloud, saying, "This is my dear son, in whom I delight; hear him." He was still speaking when a bright cloud overshadowed them, and from the cloud a voice said, "This is my Son, the Beloved, in him is my delight: listen to him." While he was yet speaking, behold! a luminous cloud overshadowed them; and a voice out of the cloud, saying. "This is my Son, my Beloved, in whom is my delight. Listen to him." While he was still speaking, suddenly a bright cloud overshadowed them. And suddenly a voice came out of the cloud, saying, "This is my beloved Son, in whom I am well pleased. Listen to him." While he was yet speaking, lo! a bright cloud overshadowed them; and lo! a voice out of the cloud, saying, "This is my beloved Son, with whom I am well pleased; hear him." While he was yet speaking, behold a bright cloud overshadowed them; and behold a voice from the cloud, saying, This is my beloved Son, with whom I am well pleased; hear him. While yet he was speaking, lo! a brightly shining cloud, overshadowed them, and lo! a voice, out of the cloud, saying - This, is, my Son, the Beloved, in whom I delight, - Be hearkening to him. And while he was yet speaking, behold, a luminous cloud overshadowed them; and lo! 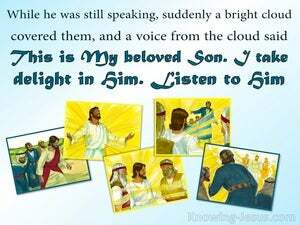 a voice out of the cloud, saying, This is my beloved Son, in whom is my delight; hear him! While he was still speaking, a bright cloud enveloped them, and there was a voice from the cloud that said-- "This is my Son, the Beloved, in whom I delight; him you must hear." While he was still speaking, a bright cloud cast its shadow over them, and a voice from the cloud said, "This is my Son, my Beloved, in whom I am delighted. 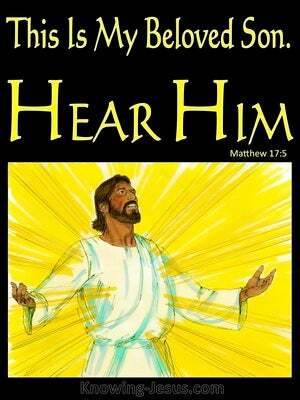 Keep on listening to Him!" While he was yet speaking, behold, a bright cloud overshadowed them. And, behold, a voice out of the cloud, saying, "This is My beloved Son, in Whom I delighted; hear Him." And as he was speaking, lo a bright cloud overshadowed them, and a voice out of the cloud, saying, This is my beloved Son, in whom I am well pleased; hear ye Him. 4 Then answered Peter, and said unto Jesus, Lord, it is good for us to be here: if thou wilt, let us make here three tabernacles; one for thee, and one for Moses, and one for Elias. 5 While he yet spake, behold, a bright cloud overshadowed them: and behold a voice out of the cloud, which said, This is my beloved Son, in whom I am well pleased; hear ye him. 6 And when the disciples heard it, they fell on their face, and were sore afraid.